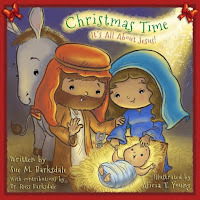 I absolutely love Christmas time and am always on the lookout for more great books to help celebrate the season. While I don't have children of my own, I do have nieces and nephews and a healthy love for children's books! Putting a fresh take on the Christmas story may be hard as it is one of the most familiar and beloved stories for children. So what makes this book stand out? First of all, I appreciate that it is written in a rhyming format which is sure to be fun for young children (and is actually a very helpful component of learning to read since it aids in prediction). Secondly, the illustrations are completely charming! They are really beautiful and very cute and perfectly suited to the text. I also really appreciate that Christmas Time tells the whole Christmas story, starting from the beginning and creating context for the events that took place while wrapping up with a reminder that this is the reason we celebrate today! Finally, the last few pages of the book include devotionals or questions that enable parents to go back over the story and talk about what all the different aspects of it mean. I find this unique for a picture book and think it could be great! Overall, if you're looking to add a book about the Biblical Christmas story to your library, I think this is a good one!